Thailand has voted for the third time since the military staged a coup in 2006. The crony populists won again. The establishment thugs didn’t even compete. The country is headed toward more and more dangerous political turmoil. Thailand’s latest poll was triggered by mobs which sought to drive Prime Minister Yingluck Shinawatra from office. Although the protestors wear yellow, they are the modern equivalent of Benito Mussolini’s Black Shirts, who seized power through the infamous 1922 march on Rome. The misnamed Democrat Party and its ally, the People’s Democratic Reform Committee (PDRC), led by former DP deputy prime minister Suthep Thaugsuban, then attempted to block Sunday’s vote. The Thai political system is nominally democratic. But the state typically was controlled by an elitist establishment, essentially a military-royalist-civil service-business-urban/upper class axis. That was overturned by the 2001 victory of telecommunications executive Thaksin Shinawatra, who followed the traditional political strategy of tax, tax, spend, spend, elect, elect. Thaksin won another big victory in 2005, but the following year the so-called People’s Alliance for Democracy launched demonstrations to bring down his government. The military then ousted him in a coup. The next election in 2007 was won by Thaksin’s successor party (though he remained in exile abroad). But PAD soon launched a series of protests to shut down the government—taking over Bangkok’s international airport, for instance—and the security agencies refused to intervene. Establishment pressure on the government’s coalition partners caused them to shift to make the DP’s Abhisit Vejjajiva prime minister even though his party had not won even a plurality of the vote since 1992. 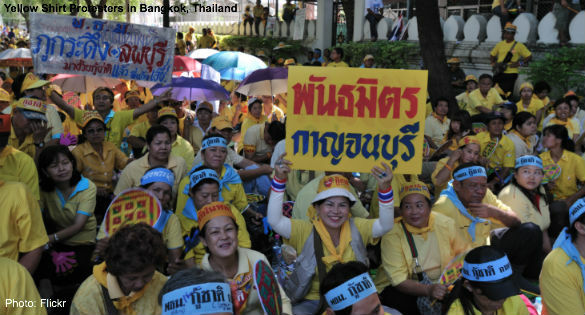 In response angry Thaksin supporters, called “Red Shirts”—dominated by the rural poor and middle-class—flooded into Bangkok. The police and army rediscovered their commitment to public order and in 2009 cleared the streets, killing scores of protestors and injuring thousands of others. Then Abhisit was overwhelmingly defeated in 2011 by Yingluck, Thaksin’s sister. Last fall PAD relaunched itself as the PDRC and mounted large demonstrations against her government. As before, the opposition used storm trooper tactics, even threatening to seize the prime minister. Yingluck responded by calling an election, but that was the last thing the protestors wanted. So the Thai Black Shirts proceeded to block candidate registrations and early voting and halt polling in several areas. Thaksin embodies the worst of irresponsible populism and has been convicted of corruption, though Thai courts often sacrifice justice in order to strengthen establishment rule. Yingluck is widely viewed as Thaksin’s stand-in. Worse, however, is Suthep. He called for a “people’s revolution” with an unelected “people’s council,” which he would get to fill, to “reform” election rules, which would guarantee his victory, before the next poll is held. He and his cronies want an authoritarian system which close-knit elites quietly dominate irrespective of election results. Suthep’s crowds evoke memories of fascist bullies which on election day even attacked Thais seeking to vote. Despite the Black Shirts’ efforts, Prime Minister Yingluck was reelected. But Suthep is determined to take power irrespective of his lack of popular support and the Black Shirts want to make the country ungovernable. Yingluck’s opponents may file charges of alleged electoral violations and urge the Election Commission to nullify the vote. That could trigger violent demonstrations from the Red Shirts. By blocking candidate registrations the Black Shirts prevented the poll from filling the required 95 percent of parliament’s seats, requiring by-elections before the body can open. The opposition also may turn to the courts, which are hearing a number of highly political charges. However, Red Shirt activists are unlikely to peacefully accept a judicial coup. If all else fails, the Black Shirts are likely to take more radical steps to overthrow the new government. Chaos in Bangkok might cause the military to stage another coup. But the 2006 coup leader, Sonthi Boonyaratglin, warned that the military likely would face violent resistance from not just the Red Shirts but the “mass” of people. In short, Thailand’s political future looks at best uncertain and at worst disastrous. The only hope may be constitutional reform reducing central government power. If Bangkok was less dominant and regions could chart their own course, the Red Shirts and Yellow Shirts would have less incentive to battle to the political death. Thaksin may be a blight upon Thai politics, but Suthep and his allies are a cancer. Unfortunately, in Thailand democracy does not guarantee good government. However, authoritarian, undemocratic rule would be far worse. Suthep’s Black Shirts will bear the primary blame if their nation descends further into violence and disorder.